Lori Samele-Bates serves as a Government Relations Specialist in Brown Rudnick’s Hartford Office. She focuses on providing public policy services to clients, including administrative and legislative lobbying, as well as aiding in the development and execution of strategies to achieve her clients’ goals. She also assists with grass-roots strategies, advocacy and constituent development. Lori has significant experience advocating to policymakers on the federal, state and local levels. 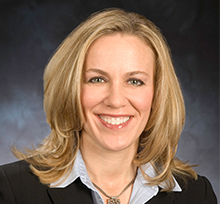 She was formerly the Manager of Government Relations for Cablevision of Connecticut, where she acted as the primary liaison with three regional cable advisory councils and ensured company compliance with Department of Public Utility Control (DPUC) regulations. Lori also has experience with the Connecticut State Senate in serving as Supervisor of Legislative Aides, where she worked with Senate leadership officials to create legislative strategies and consensus-building. Prior to joining Brown Rudnick, Lori worked as a Government Affairs Consultant at Murtha Cullina LLP, where she focused on assisting clients in the environmental, education, energy and health care industries.